The world according to Robin - A techno-related blog with tips and tricks, and the occasional rave about… anything! When you buy a DVD movie at the shop you would like the opportunity to back it up. However, due to the built-in copy protection, this might not be a simple task if you do not have Ubuntu with k9copy and K3b installed. k9copy is able to break the copy protection and make a DVD image which you can burn to DVD using the burning application K3b (or other DVD burning software). Because ordinary DVDs are dual-layer (8.9 GB), the size of their content exceeds the capacity of cheap, single-layer recordable DVDs (4.4 GB). Luckily, k9copy can also shrink the DVD image to fit on a single-layer DVD. The quality loss is most of the time negligible but if you worry about this, the software gives you an option to only copy parts of the DVD content, e.g., only the movie itself without extra material. Naturally, if you have those expensive burnable dual-layer DVDs, you can copy the entire DVD without any loss of quality. Download DVDDecrypter, DVDShrink, and Imgburn (see below). DVDDecrypter removes the copy protection and let you copy the DVD to your hard drive. You may then use DVDShrink to shrink the DVD copy to fit on a single-layer DVD. Apparently it is possible to use DVDShrink for the entire operation (both copy and shrink) but in my experience you should use DVDDecrypter for the copying, and DVDShrink for the shrinking. The shrinked DVD folder or image file can be burnt to a burnable DVD using DVDDecrypter or ImgBurn. You can find more video-related applications, troubleshooting, and guides at Doom9. They claim that DVDDecrypter may have trouble ripping new DVDs with structural protection. If you experience problems, you may try DVDFab HD Decrypter 5.0.9.0, however, I have no experience with this program. You might also consider switching to Ubuntu or other Linux distributions! 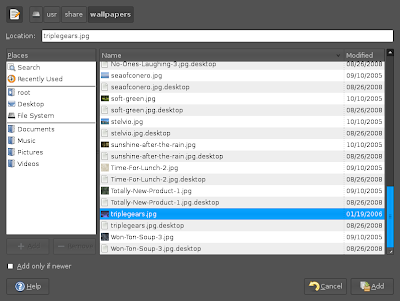 Gnome Do is a quicklauncher for Linux. 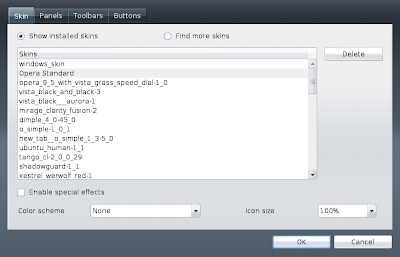 Although the name implies it is a Gnome application, it apparently works just as well in XFCE4 or KDE. 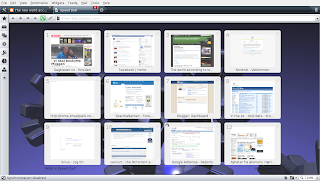 Similar to the search feature of Opera (which remembers visited websites and content), Do allows you to quickly search for items in your desktop environment and perform useful actions on those items. Do is inspired by Quicksilver and GNOME Launch Box. You launch Do with Super+Space. Then, if you want to send an email to John, simply type “email john.” If you want to listen to Radiohead, type “play radiohead.” Also, Do is able to learn from your previous actions. 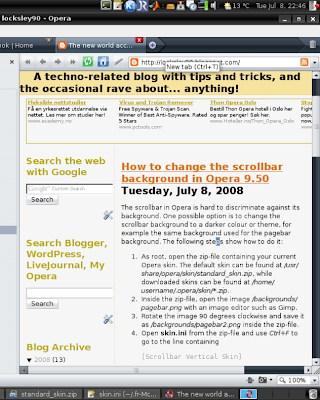 Therefore, if you for example use the Opera web browser often, typing “o” in Do will launch it. 1. Add the Gnome Do PPA Repository to your sources list. More information about this nice, fast, and lightweight application can be found at the Gnome Do wiki. As root, open the zip-file containing your current Opera skin. The default skin can be found at /usr/share/opera/skin/standard_skin.zip, while downloaded skins can be found at /home/username/.opera/skin/*.zip. 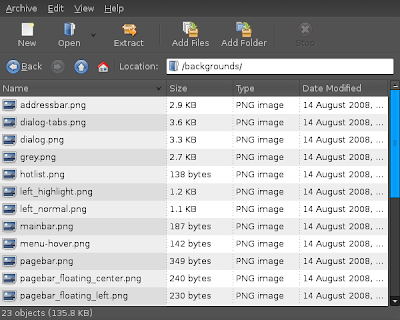 Inside the zip-file, open the image /backgrounds/pagebar.png with an image editor such as Gimp. Rotate the image 90 degrees clockwise and save it as /backgrounds/pagebar2.png inside the zip-file. Save skin.ini inside the zip-file and restart the browser. Go to Tools –> Appearance –> Skin to find out which skin you are using. If it says Opera Standard, you are using the default skin, otherwise, you are using a downloaded skin. Note the name of the skin. 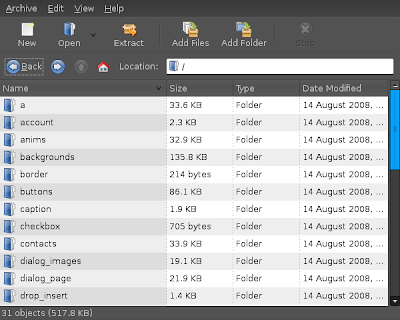 Open the folder /backgrounds in the zip-file by double-clicking it. 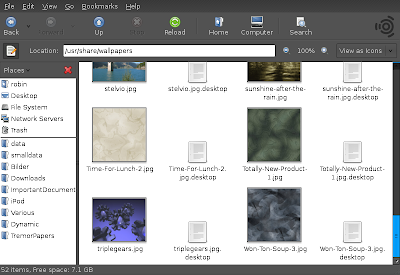 Open a file browser (Nautilus) and locate a background image that you want to use, e.g., /usr/share/wallpapers/triplegears.jpg. 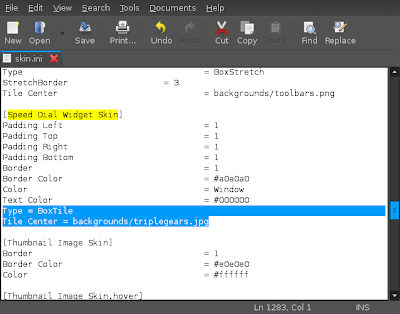 Add the background image (triplegears.jpg) to the /backgrounds folder by pressing the Add Files… button and locating the image. 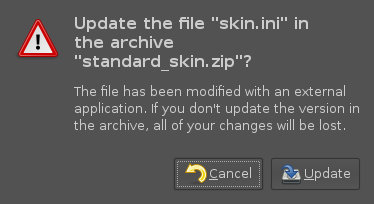 Save skin.ini inside the zip-file, click “yes” to update the archive, and restart the browser. Note that your newly installed background image for the Speed Dial tab may be affected by the current color scheme. In my case, the background image became very bluish because the color scheme was set to system colors. To avoid this, go to Appearance (Shift+F12) and make sure Color Scheme is set to No color scheme. Go to Help → About Opera and note the path of your main Opera directory (look for the opera6.ini file), usually /home/username/.opera/. Start Opera and note the change. You can still open the 9 first speed dials using Ctrl+n, where n=1-9. To add shortcuts to the other speed dials, follow this guide. To get some extra space, you can turn off the search field the top of the Speed Dial page. Enter opera:config#UserPrefs|SpeedDialSearchType in the address field, hit Enter, and replace the value with 0. Scroll down to the bottom and click Save. The changes will take effect immediately without restart. There are several reasons you should install Ubuntu on a USB flash drive. First of all, a USB memory stick is easier to bring around than a Live CD if you need to install Ubuntu on a computer. But more importantly, by installing the persistent version, not only can you use your USB as a Live CD, but in addition, you can save any changes to the system to disk! In effect, this means that you have your own portable system that you can bring anywhere. Forget the worry of bringing your valuable laptop on vacation. Instead, once you have booted your system onto somebody else’s computer, you can install software, perform system upgrades, and do your work on your own customized system with your own software installed. Everything you do is saved onto your USB stick. And if you do need to access or save something on the underlying system, the computer hard drives will be automounted at startup. Naturally, your system will be limited by the disk size of your USB. Most installations use about 700 MB (the size of a Live CD) for the Live portion of the system, leaving the rest of the disk as free space. With a dirt-cheap 4 or 8 GB USB stick, you have plenty of space to install software and files. Running a system from a USB can also be convenient if you need dedicated servers to perform exactly what you want. Rather than going through a procedure of installing necessary software and making sure that everything works on the existing system, which likely is a Windows computer loaded with crap, you simply plug in your pre-prepared USB stick and boot from it. It is cheap and quick to buy 10 USB sticks, prepare the system and software on one of them, and then replicate the entire system onto the 9 others. Another great usage is for removal of viruses on a Windows system. Viruses are often hard to get rid of, as they might get loaded during boot-up and refuse to be deleted by the Windows antivirus application. Booting Ubuntu from the USB and running a virus scanner such as Avast or Clam (Clam is also available from repositories) should enable you to remove the viruses. See my guide for further instructions. So how do you make such a USB stick? I just followed this guide, which was a piece of cake. If you want the USB stick to also work as a normal flash drive when connected to a computer, you might want to add a third partition in addition to the two needed for the Ubuntu Persistent system. Format it as NTFS so it is readable on both Windows and Linux systems. You might need to have this partition as the first partition for Windows to discover it. I have not tried this myself, but believe it should work. After this process, your VDI file size should be approximately equal to what the guest system reports being in use. Consider the following example: I run Ubuntu 8.04 as the host system and have Windows XP installed as a guest machine. The corresponding VDI file, winxp.vdi, has a virtual size of 20 GB and an actual size of ~18 GB. However, logging in to the virtual Windows XP system, it tells me that only 3 GB of disk space is in use, while 17 GB is free. How can I shrink, or compact, the VDI file to only use about 3 GB as needed? Afterwards, the actual size of winxp.vdi is only ~3GB, that is, about 15 GB of free space has become available to Ubuntu.